Please Note: This camp has special requirements. Before signing up please call or email the camp director to see if you child is at the appropriate level to participate. learn the fundamentals of bending and flexing the horse through basic dressage work. If the camp session you wish to enroll in is full, you can be put on a wait list by emailing the office with your contact information, your childs name, age and the week(s) you want to be wait listed for. Campers need to bring a light snack and water bottle. 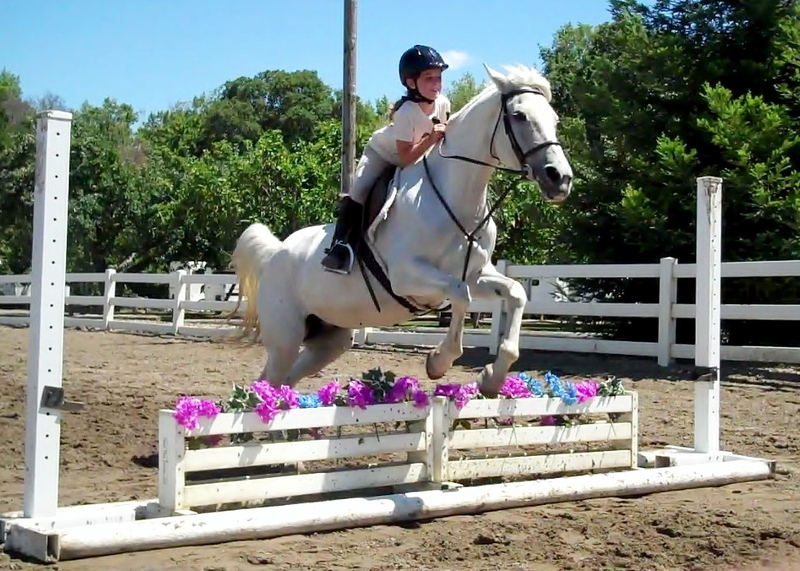 All campers should wear: Long Pants, Applied sunscreen, Riding Helmet, Riding type boots, breeches and chaps. Riding helmets and boots are available for loan at no charge. Bike helmets and hiking boots are not allowed. If you are concerned about sharing helmets, you may purchase one for $45. To purchase a helmet click here Helmet Order Form. Fill out the form and include it with your camp registration. Click here Jumping Camp Registration for the registration packet. The packet contains: Camper Information Form, Jumping Camp Registration Form and Signature Page of the Release Form. Fill out and sign all the forms fully, include payment by check, cash, debit card, Visa or Mastercard. Payment must be included with your forms to hold a space. If you are paying by credit or debit card fax to 415-897-8306 or email to contactmsf@aol.com. You may also drop the forms off at the Morning Star Farm office. Please use the mail slot located by the office door. You will receive a confirmation call once we receive your registration forms and payment. Refunds - less $50 booking fee for all cancellations up to April15th. Thereafter No Refunds will be given unless the space can be filled from our waiting list, then the above rule applies. Substitutions - After you receive confirmation, you have 48 hours to make any changes in camp date or camper. After this time a $50 fee is required for any substitutions of camper or camp date. (subject to availability).